This is the perfect punch to serve in the Fall or around Thanksgiving. At least 8 hours before serving, mull half the cider by placing it in a saucepan and adding mulling spices. Bring to a boil and simmer for 1-3 hours. Strain out the mulling spices and chill. When ready to serve, combine mulled cider, plain cider, orange juice and sparkling water. 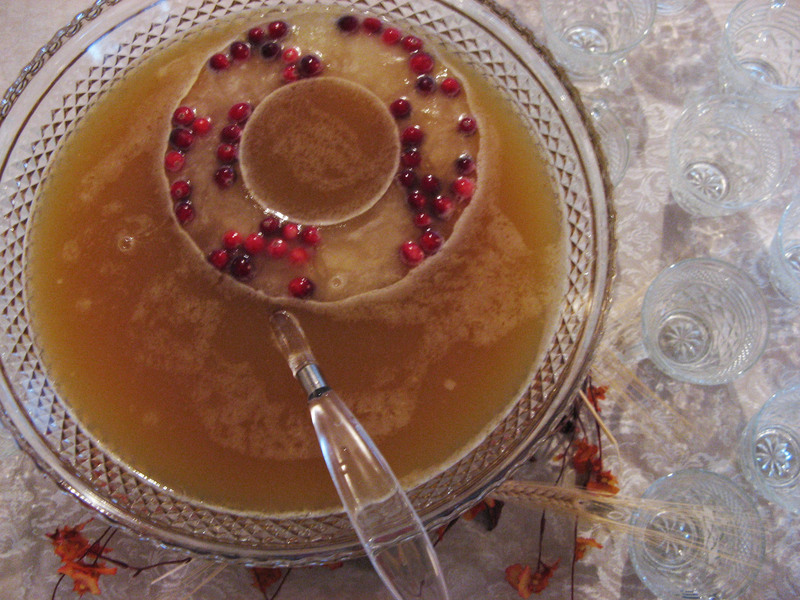 I made an ice ring using apple juice and fresh cranberries. Combine dry ingredients. Mix together oil, eggs, milk, and vanilla. Add wet ingredients to dry and mix until combined. Add chopped apples. 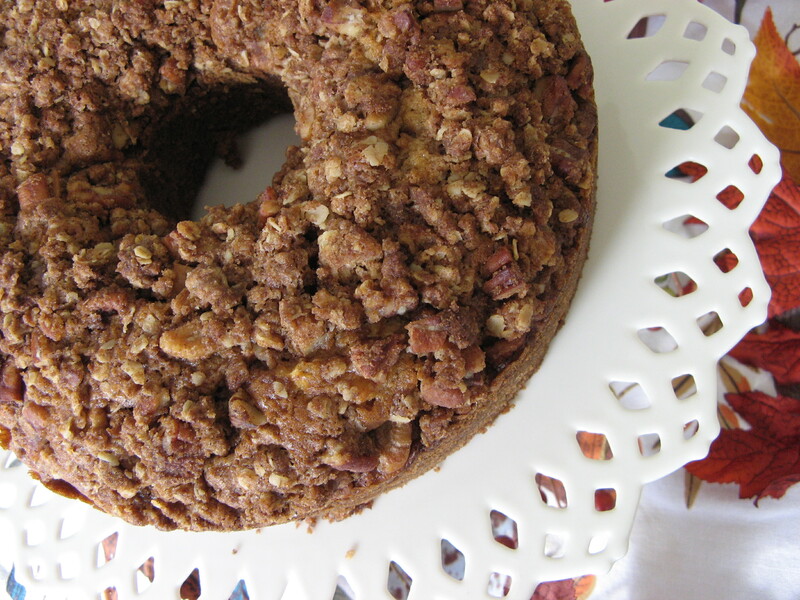 Pour into greased and floured bundt pan or 9x13 pan or muffin tins. Cover with crumb topping. Bake 35-40 minutes (or until done) at 350. Peel and dice squash. Cut sausages into pieces (about 1.5 inches long). Chop onion. Combine onion, squash and sausage on a baking tray. Coat with oil, salt, pepper and thyme. Roast at 375F until squash is tender (about 1 hour.). Meanwhile, prepare pasta according to box directions. Keep warm. 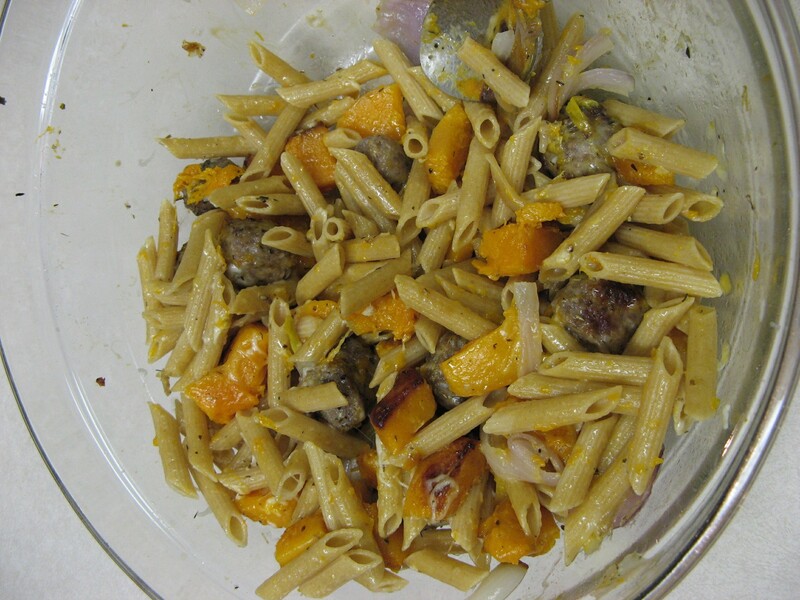 When squash is cooked, add to pasta and throw in a few handfuls of grated cheese. Preheat the oven to 375 degrees. Grease a 9-inch springform pan, line with parchment paper, grease the paper, then flour the pan. In a medium bowl, whisk together the flour, baking powder, and salt. In a large bowl, whisk together 3/4 c. granulated sugar and the 2 eggs until pale yellow, 1 t0 2 minutes, whisk in the butter. Stir into the flour mixture until just combine. Pour half of the batter into the prepare pan and top with half of the pear slices and half of the chocolate; repeat with the remaining batter, pears, and chocolate. Using the food processor (or a blender), finely grind 1/4 almonds with the remaining 1/4 c. sugar. Add the egg white and process until smooth. 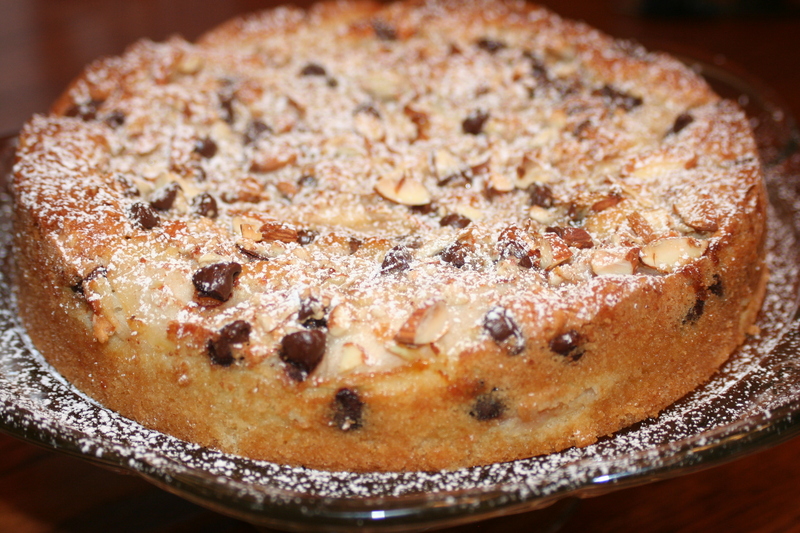 Drizzle over the cake and sprinkle with the remaining 1/4 c. almonds. Bake until a toothpick inserted into the center comes out clean, 45-50 minutes. Let cool slightly, then dust with confectioners' sugar. Serves 8 - Enjoy! It's delicious! *Bananas were suggested as a substitute.